I'm at the airport waiting for my flight to Houston. You may be thinking "WHAT is in Houston?" The ENDO 2012 conference! 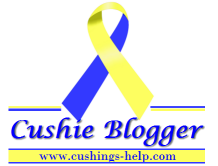 I'm going to represent the Cushing's Support and Research Foundation at their exhibit booth. I'm excited for the experience, and as you may know, not too excited for the flying to and from part. The good news, is already I can spot some endocrinologists that I have seen before so I know I would be in good hands if something were to happen (which it's not). I have downloaded the ENDO app for my phone and found that we will be in booth #1829. I got to bookmark booths that I would like to stop by, as well as the food and relaxation booths. I am going to try and blog as often as possible while I'm there, probably at the end of each day. We will be boarding soon so I should pack up and get ready! Talk to you from Houston!